How often do you make a list for the grocery store and then leave the list at home and have to remember what you wrote down? That is Fatima’s dilemma in Grandma’s List, a Children’s Africana Book Award winner by Portia Dery, illustrated by Toby Newsome. Africa Access highlights the best books about Africa especially during its February Read Africa initiative but throughout the year as well. 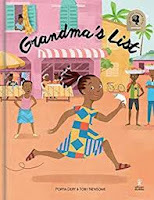 Fatima has convinced her grandmother she can help with the chores on Grandma’s list of errands – but she loses the list and has to remember all the details, mixing up just about everything. Contrary to expectations, Fatima’s family is very forgiving and she concludes that being a child isn’t so bad after all. · How does the dinner table look the same as yours? Different? · What about the village scene – what looks familiar? Can you draw a picture of your neighborhood on a Saturday morning? · Have children write their own list of grocery items or household tasks and imagine they lost the list. Ask them to write a paragraph about how they could help themselves remember items without that list. · Encourage children to consider the importance of details. Find out about cornflour – the kind Fatima mistakenly purchased – and write a paragraph about how it is used differently from wheat flour. Try to find a Ghanaian recipe using cornflour (usually called cornstarch in the United States). · Fatima doesn’t like her nickname “Fati.” Do you have a nickname you like – or don’t like? Write about your nickname – or a nickname you would like to have. 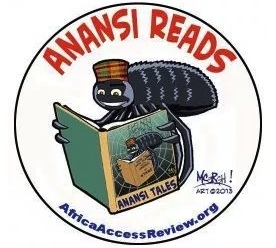 There are more classroom ideas in the Africa Access Review of Grandma’s List as well as recommended picture books (Anansi Reads) and chapter books (Sankofa Reads), book marks and reviews of Children’s Africana Book Award winners. 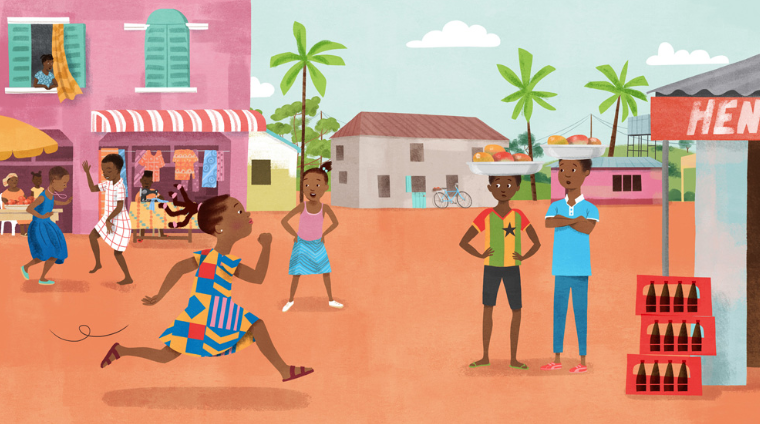 Children and teachers may add their own comments about the books they read at http://africaaccessreview.org/ - which becomes a student writing activity in itself. It is also possible for students to submit videos or posters about the books they read, write a letter to the author or illustrator and even request a visit from a Read Africa Teaching Artist. The 2018 CABA awards will be celebrated with a reception on April 5 and a family festival April 6 at the Smithsonian National Museum of African Art in Washington, D.C.